Each list item must be a file or directory path relative to synchronization base directories. Multiple items must be separated by | or a new line. Wild cards * and ? may be used: * means zero or more characters while ? represents exactly one character. Set up a file size filter with a lower limit of 0 bytes. 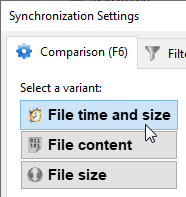 Both the time span and file size filters match files only, so this will exclude all folders. During synchronization however some excluded folders will still be synchronized if they contain at least one non-excluded item, i.e. when they are not empty. 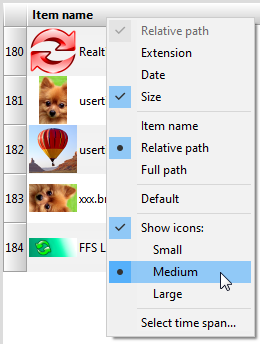 For simple exclusions, just right-click and exclude one item or a list of items directly via the context menu on main dialog. A filter phrase is compared against both file and directory paths. If you want to consider directories only, you can give a hint by appending a path separator. Both slash (/) and backslash (\) can be used as the path separator character. When you double-click on one of the rows on the main dialog, FreeFileSync opens the operating system's file browser by default. On Windows, it calls explorer /select, "%local_path%", on Linux xdg-open "%folder_path%" and on macOS open -R "%local_path%". To customize this behavior or integrate other external applications into FreeFileSync, navigate to Menu → Tools → Options → Customize context menu and add or replace a command. The first entry will be executed when double-clicking a row on the main grid or when pressing ENTER. All other entries can be accessed quickly by pressing the associated numeric keys or via the context menu that is shown after a right mouse click. Creates a temporary local copy for files located on SFTP and MTP storage. Identical to %item_path% for files on local disks and network shares. Note: To refer to the item on the opposite side, append "2" to the macro name: e.g. %item_path2%, %folder_path2%, %local_path2%. "C:\Program Files (x86)\WinMerge\WinMergeU.exe" "%local_path%" "%local_path2%"
cmd /k cd /D "%folder_path%"
Macros need to be protected with quotation marks if they can resolve to file paths containing whitespace characters. All directory paths may contain macros that are expanded during synchronization. The beginnings and ends of each macro are marked by a % character. 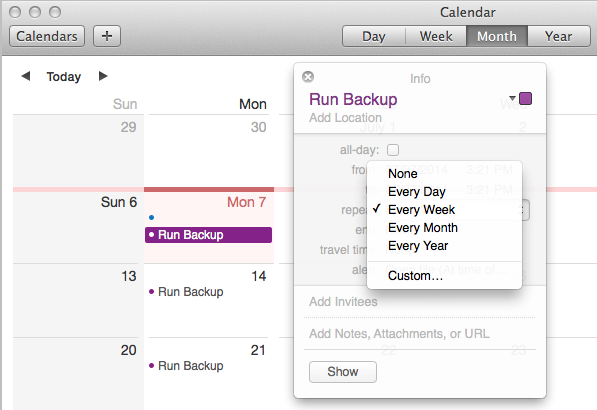 In addition to special macros handling time and date, the operating system's environment variables may also be used. Note: Most of the above macros also have a variant for public folders, e.g. %csidl_Documents% has %csidl_PublicDocuments%. 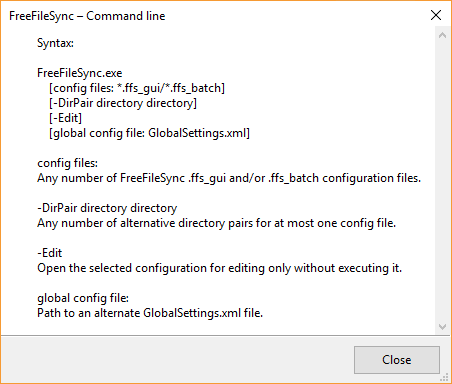 Temporary environment variables created with the set command are only valid if the synchronization is started by calling the FreeFileSync executable directly. Using start /wait would create a new program context without these temporary variables. 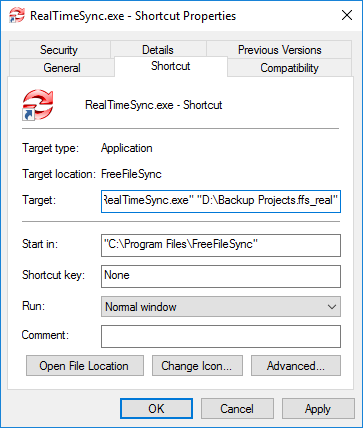 FreeFileSync can be set up to issue multiple file accesses in parallel. This speeds up synchronization times dramatically in cases where single I/O operations have significant latency (e.g. long response times on a slow network connection) or they cannot use the full bandwidth available (e.g. an SFTP server that has a speed limit for each connection). During comparison FreeFileSync groups all folders by their root devices. 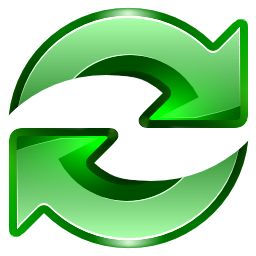 FreeFileSync will put the folders C:\Source and C:\Source2 into the same group and allow only 1 file operation at a time. Folder D:\Target will be traversed using 2 operations, and E:\Target using 3 operations at a time. In total FreeFileSync will be scanning all four folders employing 6 file operations in parallel. 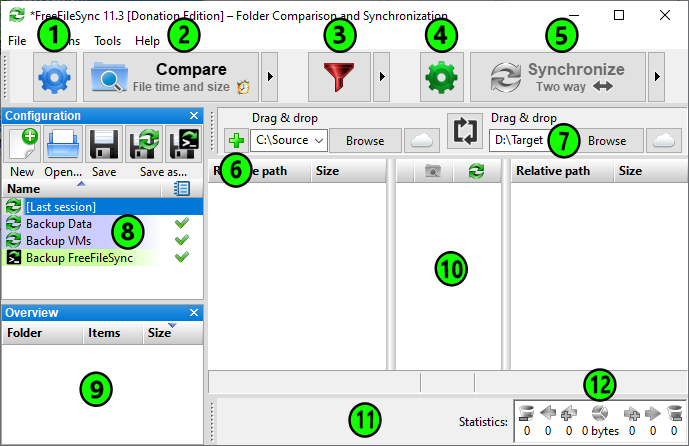 When synchronizing a folder pair FreeFileSync will use the maximum of the number of parallel operations that the two folders support. In the previous example the folder pair C:\Source ↔ D:\Target will be synchronized using 2 parallel operations, and C:\Source2 ↔ E:\target will be using 3. 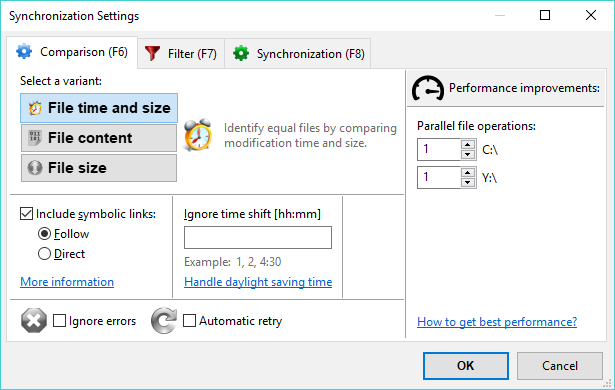 FreeFileSync implements parallel file operations by opening multiple connections to a device. Some devices like SFTP servers have limits on how many connections they allow and will fail if too many are attempted; see (S)FTP Setup. 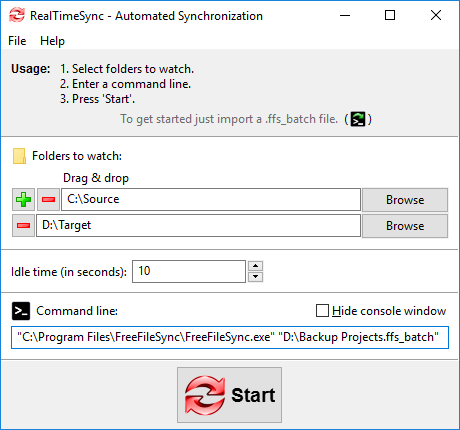 By default, FreeFileSync will show a progress dialog during synchronization and will wait while the summary dialog is shown. If the progress dialog is not needed, enable checkbox Run minimized and also set Auto-Close if you want to skip the summary dialog at the end. 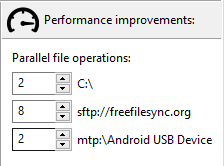 Even if the progress dialog is not shown at the beginning, you can make it visible at any time during synchronization by double-clicking the FreeFileSync icon in the notification area. If you don't want error or warning messages to stall synchronization when no user is available to respond, either check Ignore errors or set Cancel to stop the synchronization at the first error. Open the Task Scheduler either via the start menu, or enter taskschd.msc in the run dialog (keyboard shortcut: Windows + R). Create a new basic task and follow the wizard. Make Program/script point to the location of FreeFileSync.exe and insert the ffs_batch file into Add arguments. Use quotation marks to protect spaces in path names, e.g. 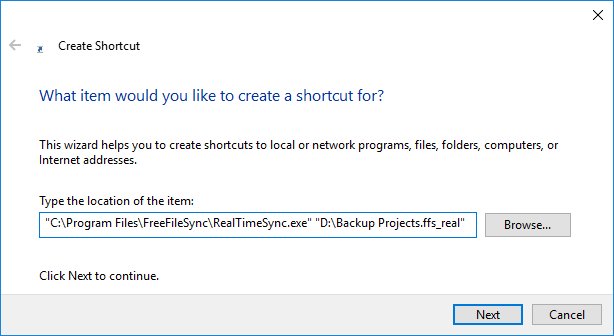 "D:\Backup Projects.ffs_batch"
Program/script always needs to point to an executable file like FreeFileSync.exe even when the ffs_batch file association is registered. If an ffs_batch file was entered instead, the task would return with error code 2147942593 (0x800700C1), "%1 is not a valid Win32 application". 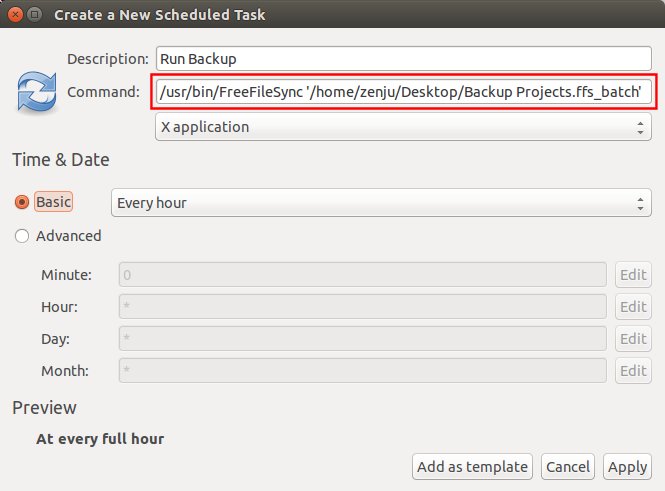 If you schedule FreeFileSync to run under a different user account, note that settings (e.g. GlobalSettings.xml) will also be read from a different path, C:\Users\<username>\AppData\Roaming\FreeFileSync, or in the case of the SYSTEM account from C:\Windows\System32\config\systemprofile\AppData\Roaming\FreeFileSync. Open Launchpad and run Automator. 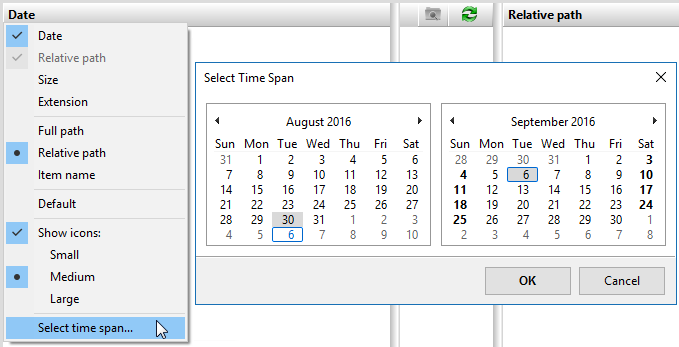 Create a new Calendar Alarm. Drag and drop the ffs_batch file on the workflow panel. Drag and drop action Files & Folders/Open Finder Items and add it to the workflow. 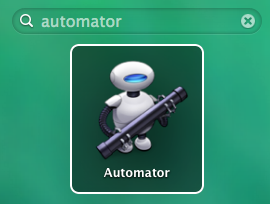 Go to File → Save... and save the Automator job. 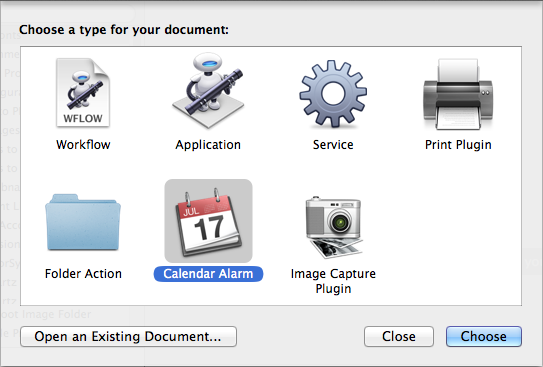 The Calendar app will start automatically with the Automator job scheduled to the current day. 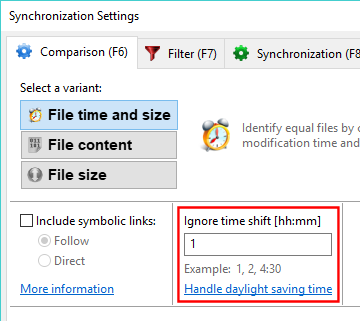 You can now select a different time for synchronization or make it a recurring task. In case the (S)FTP server sets file modification times to the current time you can do a Compare by File Size as a workaround. Another solution is to set up the Two way variant and have the files with the newer dates be copied back from the server during the next synchronization. 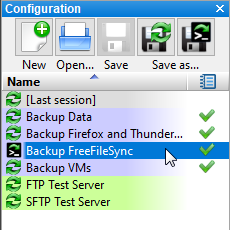 By default, FreeFileSync creates one connection to the server and uses one SFTP channel, i.e. only a single SFTP command can be sent and received at a time. Since most of this time is spent waiting due to the high latency of the remote connection, you can speed up reading large folder hierarchies by increasing both the connection and channel count. The folder reading time is reduced by a factor of N x M when using N connections with M channels each. Example: 10 connections using 2 channels each can yield a 20 times faster folder reading. The creation of additional connections and channels takes time. If you are only scanning a small remote folder, setting up too many connections and channels might actually slow the overall process down. Creating extra connections is slower than creating extra channels. SFTP servers have internal limits on the number of allowed connections and channels. Generally, servers expect one connection per user, so this number should be kept rather low. If too many connections and channels are used, the server may decide to stop responding. Unlike connections, additional SFTP channels are (currently) only used during folder reading (comparison), but not during synchronization. Start with low numbers and make tests with different combinations of connections and channels for your particular SFTP synchronization scenario to see what gives the highest speed. 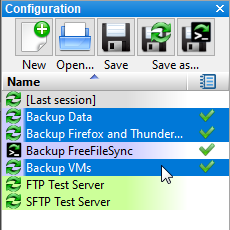 Note, however, that FreeFileSync reuses existing SFTP connections/channels. Therefore, you should restart FreeFileSync before measuring SFTP speed. 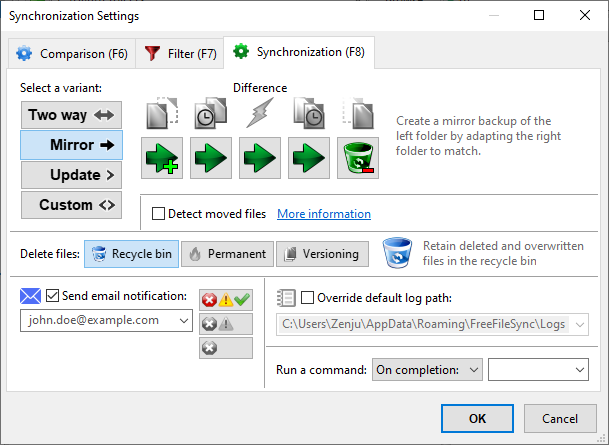 When you need to preserve files that have been deleted or overwritten, it's often sufficient to select Recycle bin in synchronization settings. However, this is only available for local drives and offers little control on how to store and how long to keep the files. FreeFileSync therefore has an additional option, Versioning. 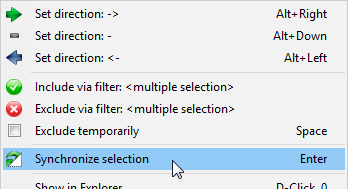 In synchronization settings, set deletion handling to Versioning and naming convention to Replace. Deleted files will be moved to the specified folder without any decoration and will replace already existing older versions. Set deletion handling to Versioning and naming convention to Time stamp [File]. 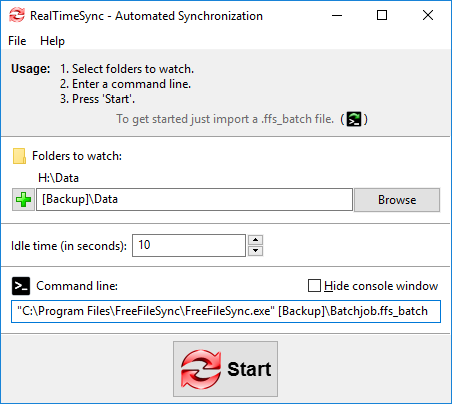 FreeFileSync will move deleted files into the provided folder and add a time stamp to each file name. 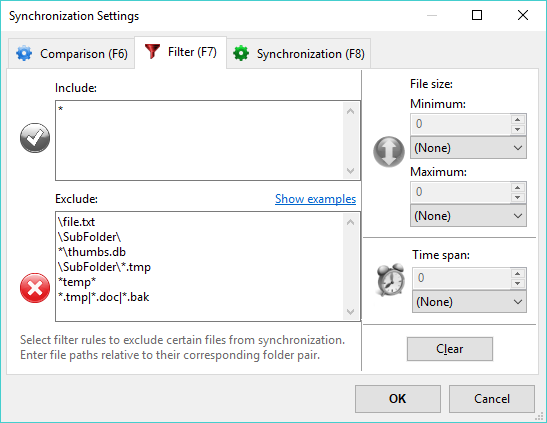 The structure of the synchronized folders is preserved so that old versions of a file can be conveniently accessed via a file browser. With naming convention Time stamp [Folder] files are moved into a time-stamped subfolder of the versioning folder while their names remain unchanged. This makes it easy to manually undo a synchronization by moving the deleted files from the versioning folder back to their original folders.